Thanksgiving is around the corner, and I love this holiday because it’s a simpler, but just as meaningful holiday as Christmas or other gift giving celebrations. In fact, instead of giving gifts, we reflect on the gifts we have already received, in so many ways. I also enjoy it because it allows me to focus on Thanksgiving table ideas and decorating, and creating a wonderful space for my family to enjoy what may be the most important meal of the year. This year I want to do something a little different (not that that is new, lol) so I have been searching for some inspiring Thanksgiving table decorating ideas that are fresh, new, but just as special. I think we have some great one’s here, and I hope you try at least a couple of new ideas. And don’t forget to be thankful for creativity! Photo by ‘Williams Sonoma‘. Using fall blooming flowers in white and green, and adding some succulents bumps up the modern vibe. Recycled brown bottles as vases keeps the vintage “homey” feel. 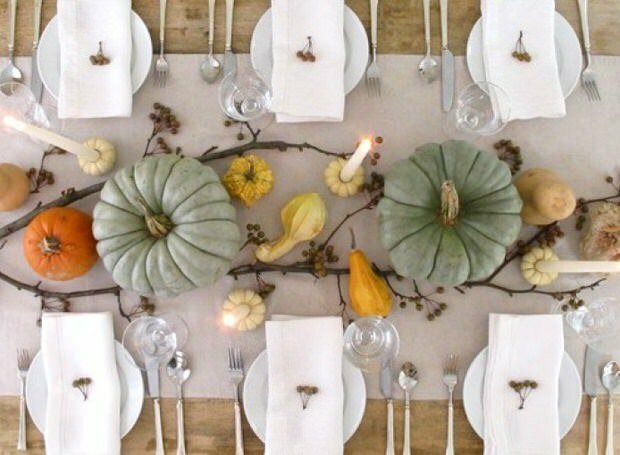 Burlap table runner, and everything else for these Thanksgiving table ideas is simple. This could be reproduced on a small or large scale. Photo source unknown. Please email if you know the original source. This one is a little over the top for most of us, but bring it down a notch and it has real potential. Find branches and plant them in tin buckets filled with rocks to keep them stable. Add moss over the top of the rocks (buy it in bags at the craft store) and simply use floating candles in clear glasses. You could use the “trees” to create thank you leaves! Use silk fall leaves and paint pens, and write a word of thanks on each leaf, then hang from the branches. Fun! If you need the warm fall colors to feel like Thanksgiving, this is a great alternative to the usual. 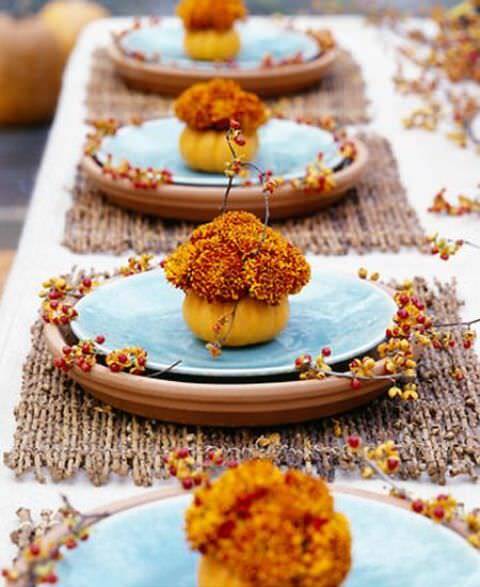 Clay pot saucers are great natural chargers, hollowed out mini pumpkins create vases for a little sprig of Mums, and natural place-mats complete the look. Want simple? 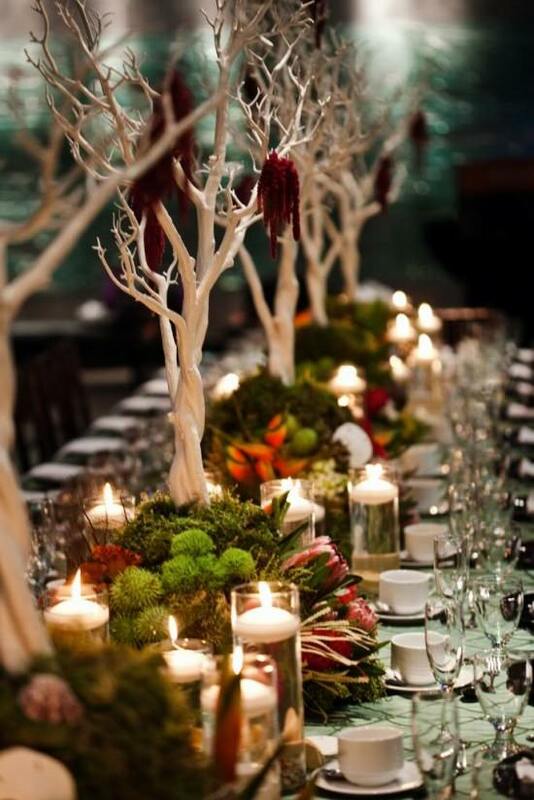 This look is a simple and minimalist look for Thanksgiving table ideas, but it lacks NOTHING in elegance. Candles, and white! Photo by ‘Martha Stewart‘. Finally, this table setting by Urban Grace Interiors is simple, yet striking. Love the use of fresh herbs. Simple metallic chargers and spray painted gold mini pumpkins add the color and sparkle to this table. One table runner, and you’re done! (No long table cloths to iron either!) Photo by ‘Urban Grace‘. Thanksgiving table ideas and decorating don’t need to be boring, and you can have a traditional dinner and still freshen up the feel. Anyone have a favorite? 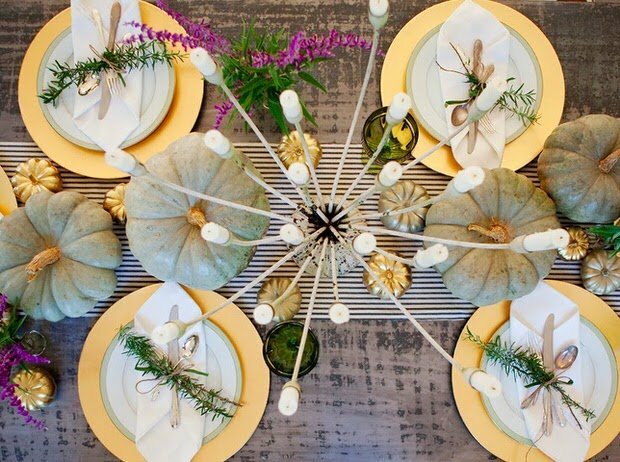 If you enjoyed this post, you might want to check out our post on classy fall decorating! Normally sized adult people could easily see over the row of candles. Seems as if they are only an inch or too taller that the stemware.